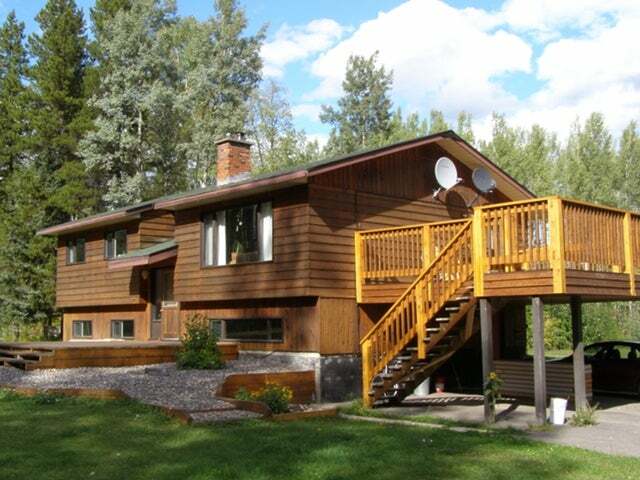 Well kept 4 bedroom, 3 bathroom home on 5 acres close to Smithers. The house provides a very practical layout with 3 bedrooms, 2 bathrooms upstairs, and privacy from the main road. The wrap-around driveway provides access to a storage shed, covered storage, woodshed, and a large 24'x40' workshop which is wired and insulated with a concrete foundation and 13' ceilings. This property is rural living at its best, with a beautiful mountain view from the garden, tree house for the kids, perimeter fencing for horses, chicken coop, and large sundeck overlooking the spacious yard.